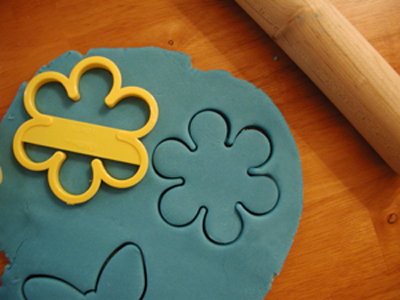 “My daughter calls play dough 'me dough!' She runs to her craft table, sits down, and politely declares that it’s time for her favorite craft of all. She wants it and she wants a lot of it. In great colors, too, like teal and magenta. The trouble is, those little 2 oz. tubs from the store never cross the threshold to our apartment - I cannot bear the smell of the real stuff. And at the speed she goes through them, the cost would really add up before she even reaches kindergarten. But would I deny our little sculptor? Never. After a little research I found a handful of recipes on the Internet. The danger with the homemade stuff is that the texture often cannot live up to the store-bought version. Fear not. All you have to do is find the right recipe. Cream of tartar is the ingredient that creates a smooth texture and not the icky graininess you (desperately) want to avoid. The clay is soft and pliable and just what you would expect. So go to the spice aisle and buy a jar (or two). This recipe is also the one my own mother made for me and my sister in the ’70s (in shockingly massive quantities). It was perfect then and I’ve been amazed at how easy it is to make…and how much my daughter loves it. It only takes 5–10 minutes and has all the qualities of the store-bought stuff except for the smell. I can quickly whip up a new batch and let my daughter pick the color she wants. Put all the ingredients in a saucepan. Whisk it together to get all the lumps out before you turn on the heat. Some days I need to add a splash more water, just to make the mixing easier - it all cooks off right away, so it’s not a big deal. Turn the heat to medium and stir constantly with a spoon or spatula. The dough will begin drying and cooking. As it clumps together, keep on stirring. Turn the heat off when the dough is mostly clumped up, but not entirely - you want to retain a good amount of moisture so little hands can easily mold it. Turn the dough out onto the counter and knead it for several minutes. Let it cool and then store in an airtight container. It took me two tries before I got it just right. You have to figure out how much moisture you lose in the cooling process, but if you make a batch that’s too dry in the meantime, just knead in some water and it will soften up. Click image above to get a good view of April's Me Dough!